What are "time tables" ? In this example, there are 3 vehicles: K2000, De Lorean and Millenium Falcon. They stop at the stop points London, Paris and Roma. These two time tables do not have their times sorted at the stop point 6. In fact, on this example, there is no solution with every line sorted. Intuitively, we would like the times at a stop point to be sorted as much as possible. Each stop point can rank the vehicles by order of preference. It looks like a rank voting, in which voters rank the candidates by preference. Here, stop points (the voters) vote for the vehicles (the candidates). A stop point preferring a vehicle A to a vehicle B means that it prefers that vehicle A appears before vehicle B. There are many types of rank voting. Most of them are Condorcet methods, named for the 18th-century French mathematician and philosopher Marie Jean Antoine Nicolas Caritat, the Marquis de Condorcet. After studying the different systems, we choose the Tideman method. This method performs well when the voters do not rank all the candidates. Adding C->B... Fail! C->B is not added to the graph. 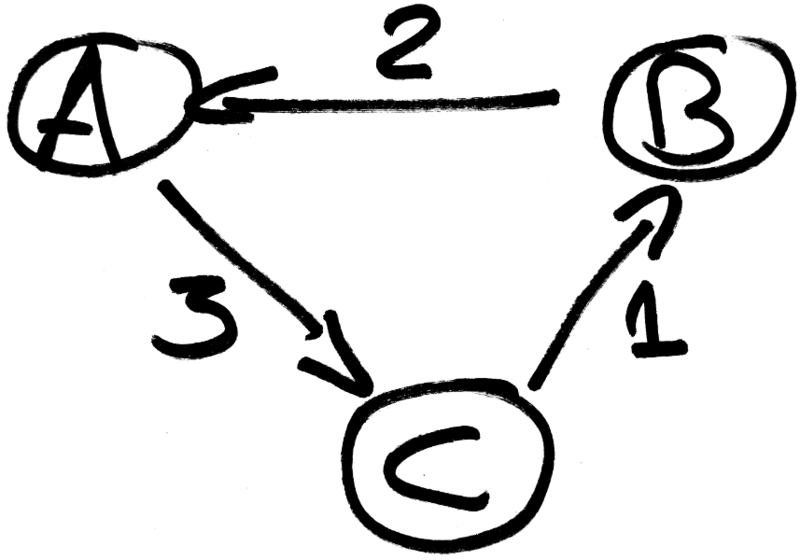 The topological sort of the created graph is C, A, B. This is our solution, corresponding to the first time table. which is much better than the naive implementation. In practice, our problematic case run in 33 seconds using the naive algorithm, and 1 seconds using the binary searches. For the details and the implementation, you can see navitia's pull request #1366. Thanks to this work, navitia can now propose a great ordering of the vehicles in the time tables. The stop points' revolution is a success: they banished the old tyrannic algorithm and can now live in democracy with a fair voting method!